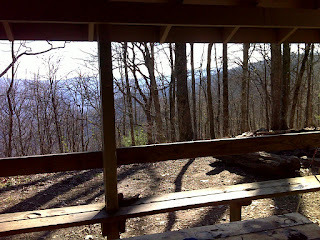 On the menu today (Monday March 26th) was the 9.6 miles of trail between Unicoi Gap and Low Gap (the one with the Shelter by the same name). Though it was a pristine, clear spring day with temperatures tickling the 80's in the high mountains and clobbering them down in the lowlands, this section of trail didn't offer any clear views, only teases and hints through the trees. 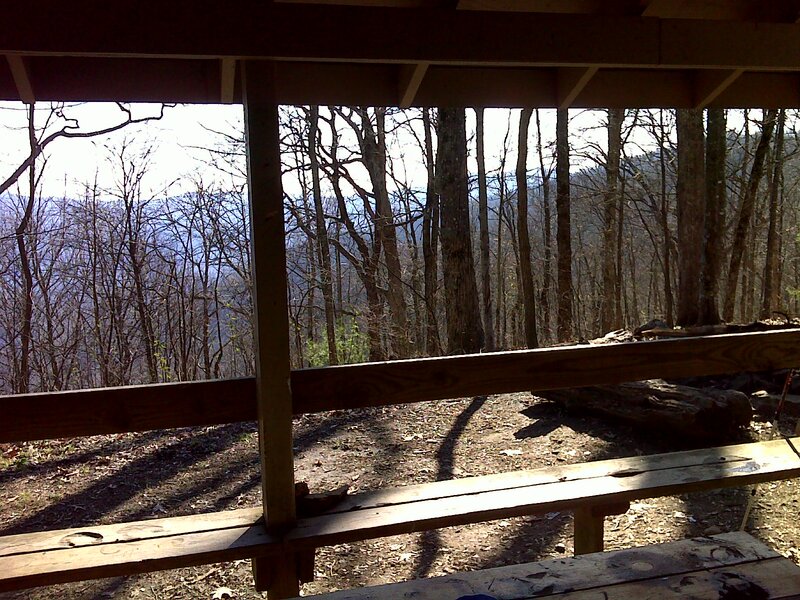 The crowds at Blue Mountain Shelter reported a beautiful sunrise. This is the vantage point - once the trees leaf out (which they are starting to do), I fear that even this will disappear. 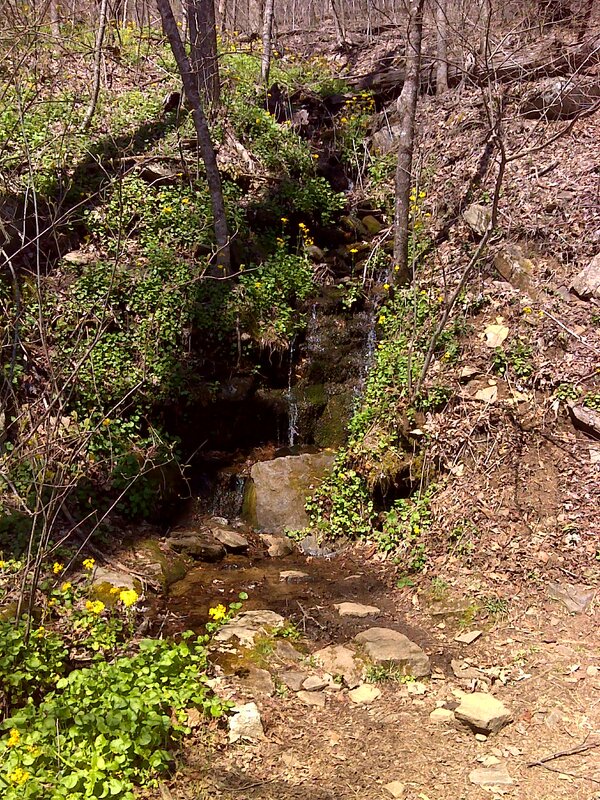 Okay, now for the Jekyll and Hyde part: I'm going to have to revisit my thoughts about Georgia's AT being a 'Bunny Trail' because the five miles from Unicoi Gap to a little beyond Chattahoochee Gap has some really rugged stuff - mostly rocky areas, sometimes intermingled with roots and mud, big step-ups/downs, etc. - in summary, the kind of footing that slows you down. But then for the last 3.5 miles or so, from Cold Spring Gap to Low Gap the trail follows a well-constructed old forest road, which is very gently graded and has uniformly smooth footing - among the easiest stretches of trail anywhere. 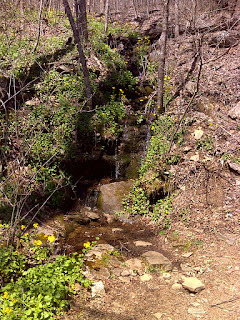 And to top it off, there was this garden spot - a noisy cascade adorned with yellow flowering greenery. It was the kind of spot that invited you to stay, soak up the warm rays of the spring sun, and revel in the newly awakening season. At 73, today's NoBo hiker count exceeded even yesterday's, and in a shorter distance. Remember, I hike one way for only half a day. This afternoon as I was returning north, another batch of thru-hikers whom I'll never meet were 'filling in' the trail behind me. It's certainly not like a NY City street where people ignore one another - everybody greets everybody else without exception, and almost always with energy and enthusiasm. And I have to admit that saying 'how are you' and 'I'm doin' well, thanks' seventy-tree times in one morning didn't seem as tedious as it might sound - every face, every gear combination, had a visual story to add variation to the sameness of the verbal exchange. It's another kind of Jekyll-Hyde story - The AT offers solitude and time to reflect most of the year, but this thru-hiker crazy-time is something well worth experiencing, at least once. Down here near the start, the atmosphere distinctly reminds me of a freshman class in their first week at university. Everybody's a little timid, eager, trying to establish their niche and learn to fit in to their new challenging environment - all in such a beautiful natural setting. I'm glad I'm here.